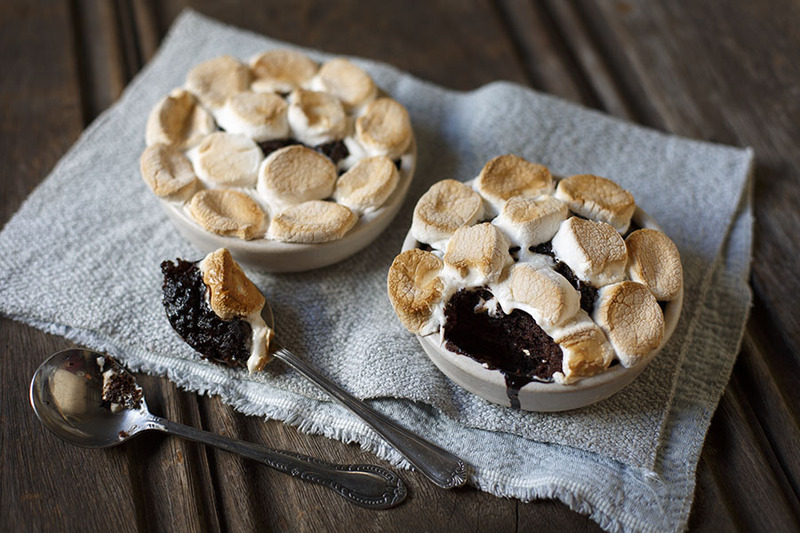 Chocolate pudding meets s’mores in this baked dessert that magically splits into a lightly spongy pudding with a chocolate sauce at the bottom. 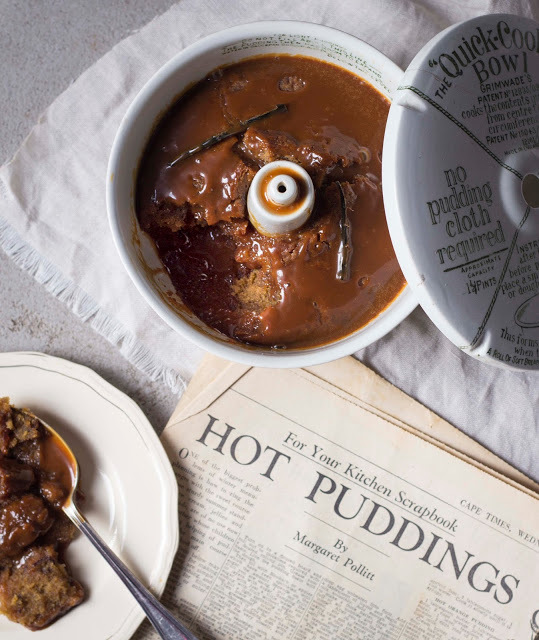 Self-saucing puddings are like the Harry Potter of the pudding world – it’s always so magical making them and as a kid I was always absolutely transfixed when my mom would pour hot water over the top of the pudding batter before putting it into the oven. I thought she was absolutely nuts, but then she’d tell me to wait for the magic to unfold so I’d sit in front of the oven on the kitchen floor and watch how the sauce and pudding swopped places in the oven! Now, I’m typing this and realizing that my mother probably just wanted 15 minutes to herself and me sitting in front of the oven watching a pudding rise was 15 minutes of pure heavenly silence! Hmmm.. I’m going to remember that trick one day! 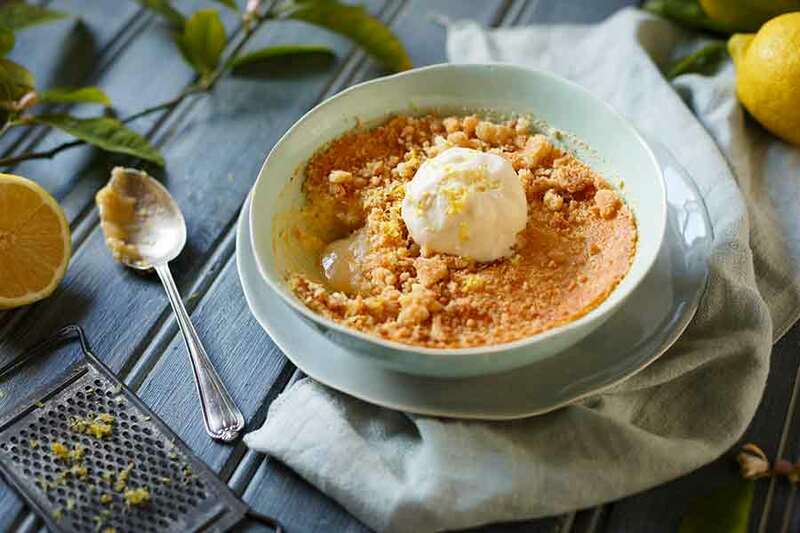 Our family cookbook is filled with self-saucing puddings – there’s a ginger pud dubbed ‘Family pudding’ that’s spicy and golden and just incredible with custard! Then there’s a tropical pudding made using ideal milk as the sauce and tin of that insanely kitsch tropical fruit mix – it’s allure for me comes from the fact that we were never allowed to eat it because it was always on it’s way to my parent’s bible study group. And then there’s this chocolate pudding. The recipe is not a family one but was rather given to me by a dear friend as a gift when I turned 16. It was one of the many recipes in the now infamous ‘Katelyn’s Favouriteistest Favourite Flopproof Recipe Cookbook – Made with love by all her friends’ (SIC). 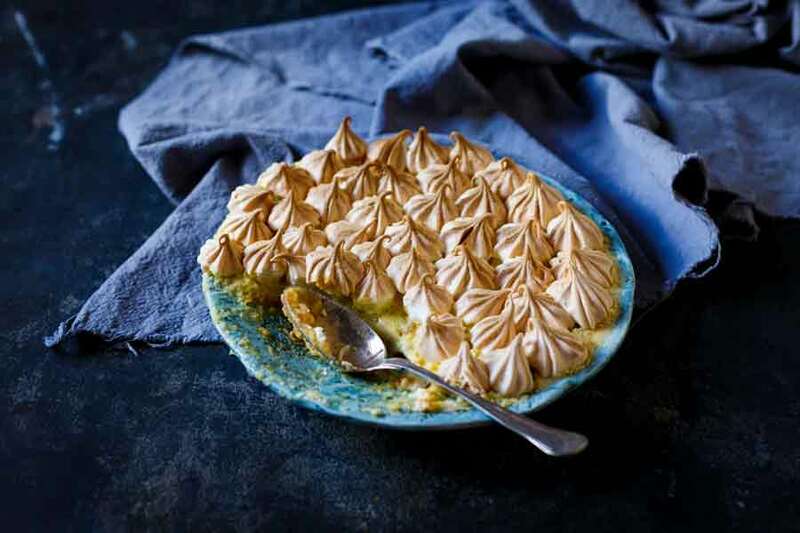 It’s one of those puddings that you can crave at 8pm after dinner and be eating it by 8.30pm – because, I know you all have those moments too! 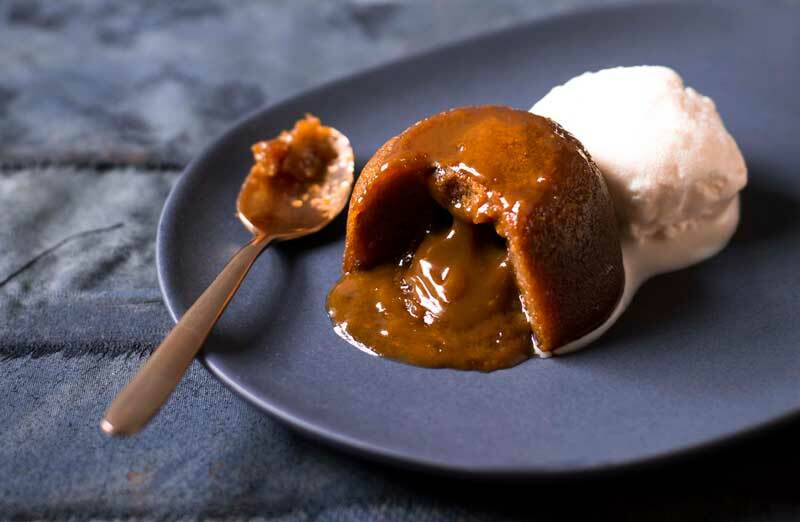 You can make this as indulgent or simple as you like – add more chocolate, a shot of espresso, some caramel but whatever you do, don’t skimp on the Natura Dark Muscovado Sugar – it’s what makes this chocolate pudding so sticky and moist and gives it a deep dark flavour which takes it to a whole other level! 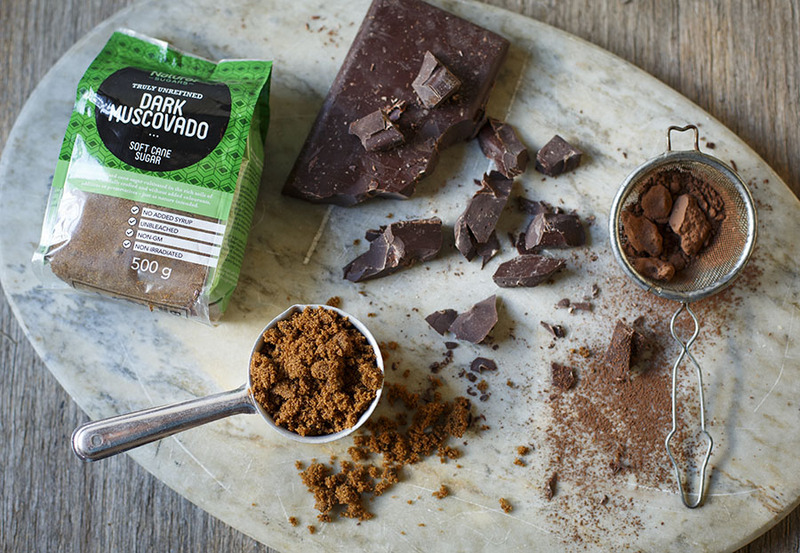 Also, the Muscovado sugar is unrefined, Non GMO and non-irradiated which are a lot of fancy words which basically mean it’s much better for you and when it comes to chocolate pudding, I don’t need much to be persuaded into going back for seconds! To make the chocolate pudding, preheat oven to 180°C (fan-forced) or 200°C (conventional). Sift the dry ingredients into a bowl. Add the milk, butter, egg and vanilla and mix well to combine. Fold through the chopped chocolate. Spoon into 4 x 1 cup-capacity oven-proof dishes and place on a baking tray. Place the extra sugar and remaining cocoa in a bowl and mix to combine. Sprinkle over the puddings and pour over the water. 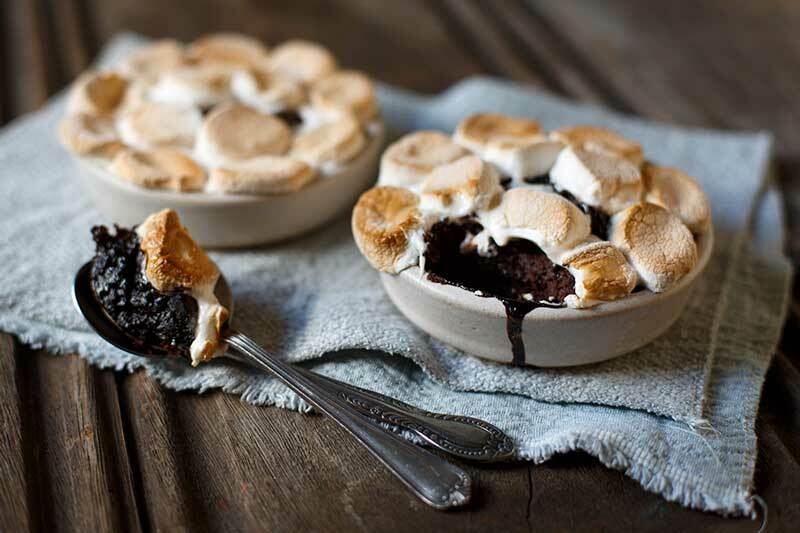 Bake for 15-20 minutes or until the tops of the chocolate puddings are firm, risen and springy but the centre should still be a bit squishy underneath then place the marshmallows on top and bake for another 3-5 minutes until golden. TIP For Mocha pudding, simply replace the boiling water with freshly brewed coffee. Disclaimer: This post has been created in collaboration with Natura Sugars, however, I only work with brands I think are awesome and that I actually use myself.